The current exhibition at the New York Public Library’s Schomburg Center for Research in Black Culture is titled, i found god in myself: The 40th Anniversary of Ntozake Shange’s for colored girls. Though on its face this weighty title sounds empowering, ultimately it belies the exhibition and the original play that engendered and shapes it. In Shange’s for colored girls who have considered suicide/when the rainbow is enuf — really a collection of poetic monologues accompanied by dance movements and music that the author calls a “choreopoem” — the moment of dramatic consummation occurs towards the end, as the women come together in a circle to reify an emotional and supportive sisterhood. 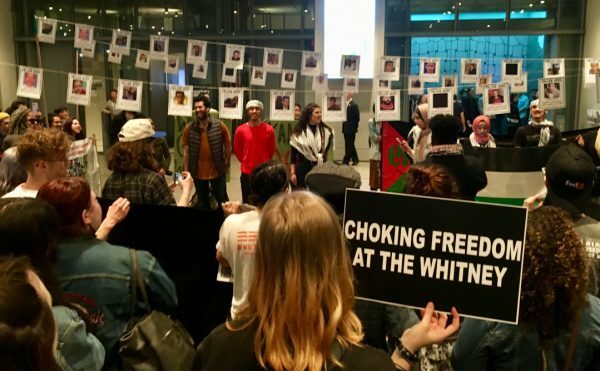 The power of the play, which has to date been turned into two films and a book, is in its solidarity, something undercut by the Schomburg exhibition’s solipsistic title. Fortunately the body of the show shadows the original conceit by being a collaboration between art makers and the play’s characters. Their work arranged in the Schomburg’s circular Latimer/Edison gallery as a concatenation, the artists here don’t find god in themselves; rather, they seem to locate the demiurge for the exhibition in a genre-crossing collaboration: excerpts from the choreopoem are placed adjacent to the artworks’ titles and have guided the construction of the pieces, which are meant to exist in dialogue with Shange’s characters. Despite the titling misstep, the work is for the most part confident, visually compelling, and sumptuous. This is a particular accomplishment because the pieces bravely reference much that’s known to be part of black women’s experience in the US — drug abuse, domestic violence, AIDs, prostitution, all issues that are often handled in much more heavy-handed ways. They play in the background here, but more present is a feeling of celebration: of the work that creates handcrafted objects, of women’s bodies, of storytelling. Clearly the play lends a narrative structure, but it also seems to condition the feel of the exhibition. The rainbow is likely enough — that is the shared recognition of these artists, and it results in a formidable show. 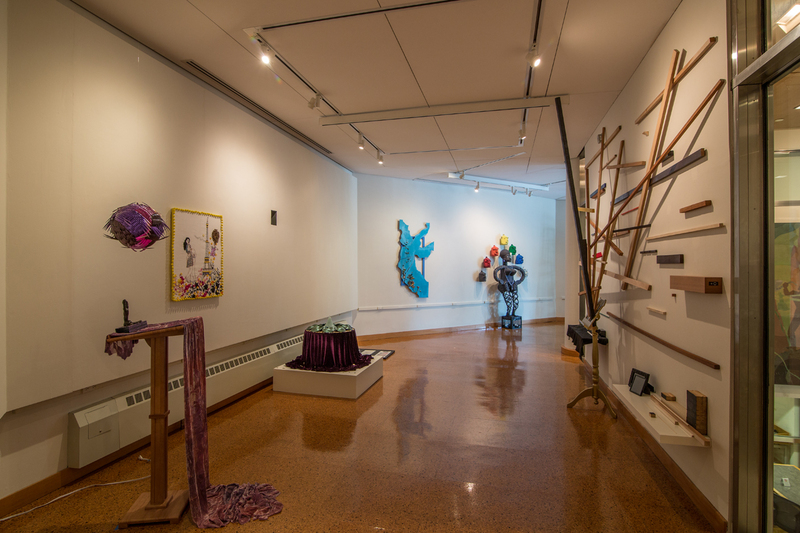 In the best pieces (all works 2014), there is an intimate relationship between the materials used, the narratives conveyed, and characters alluded to. 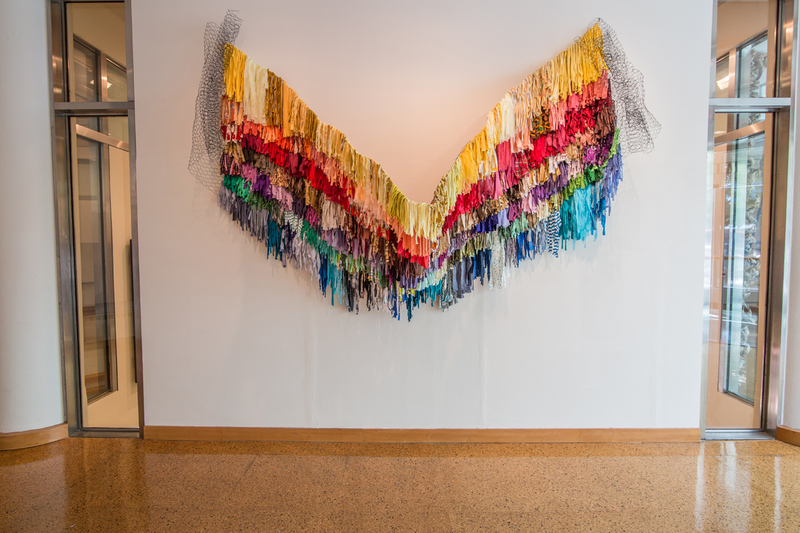 For her piece “My Rainbow is Enuf” Amber Robles-Gordon has hung strips of various fabrics on chicken wire, literalizing the diversification of types and personalities of women encompassed in Shange’s notion of the rainbow. There are shiny fabrics, opaque, striped, dotted, heavy and gossamer, creating a kind of sensuous and voluptuous arc that assuredly occupies the space. While I was present several visitors touched and felt the swatches. 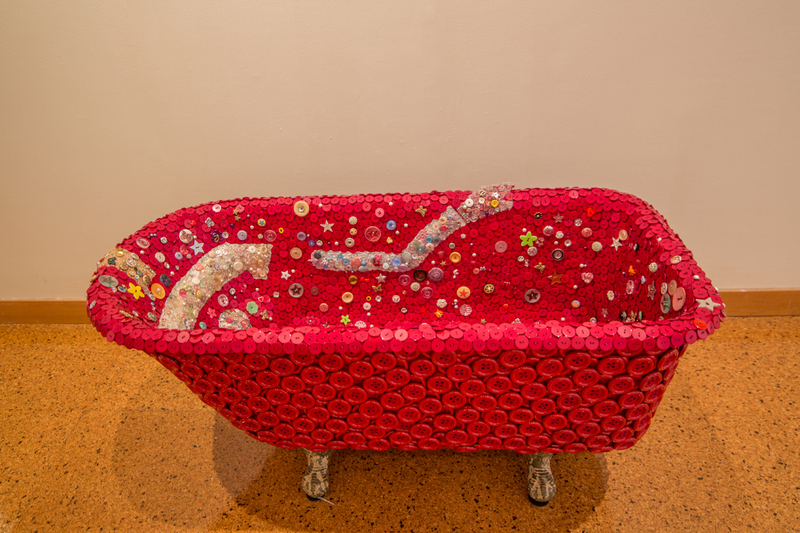 Beau McCall’s “darkmuskoilegyptiancrystals&floridawater/redpotionno.1” is similarly lavish — essentially a bathtub resplendent with buttons of varied shapes and sizes, including stars, flowers, and butterflies, with a dominant color of red. The subtle outline of a woman’s body is just detectable in a scheme of lighter-colored buttons, suggesting that the body, though sometimes obscured or elided, is always at the root of our aesthetics, as well as our utilitarian practices. 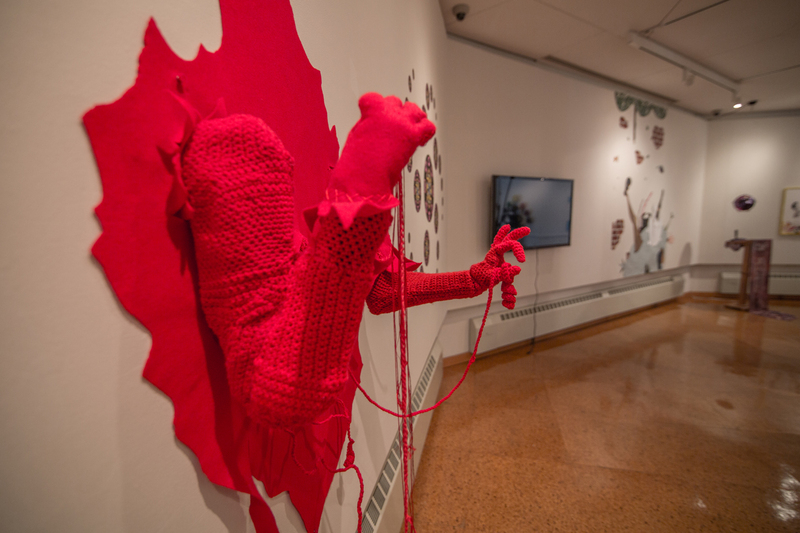 Kathleen Granados uses red felt and yarn to create a quiet and touching sculptural vignette in “no assistance”: hands on a wall pull yarn from a woven heart, dropping it to the ground, where it pools and grows into a small tree. The piece surreally implies that the material itself calls into being the body necessary to it. All of these works and others do refer to specific characters in the play, but their power lies in the statements they make in their own right. Women’s bodies are referred to consistently throughout the exhibition, just as the original play emphatically makes what happens to women’s bodies the central question of its politics. Melissa Calderon’s “Te amo más que” features a blue horn-like structure flecked with gold paint, hung on the wall, and surrounded by gilt-edged paper curled into the shape of flowers. The work is an essentialized version of the female form: lush, opulent, and open, it alerts us to the constant presence of cognates of femininity. 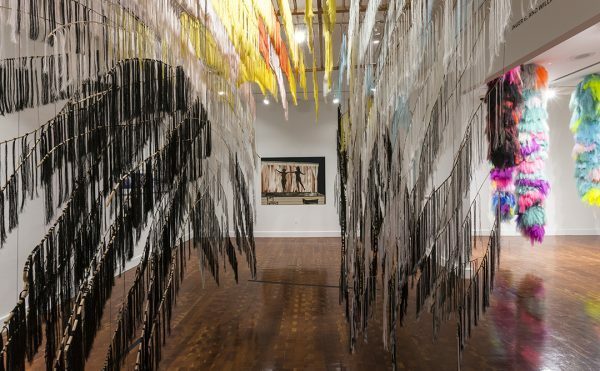 Arlene Rush’s “Sechita,” an altar to a degraded body, is comprised of a table draped in purple velvet, with scalloped, vaginal shapes of painted resin arranged in a circle around a tall mound of broken glass, a smattering of gold colored pennies strewn about. The work is simultaneously deeply sensual and uncomfortable, particularly if one is privy to the story of the for colored girls character Sechita, a prostitute between whose thighs men throw gold coins. 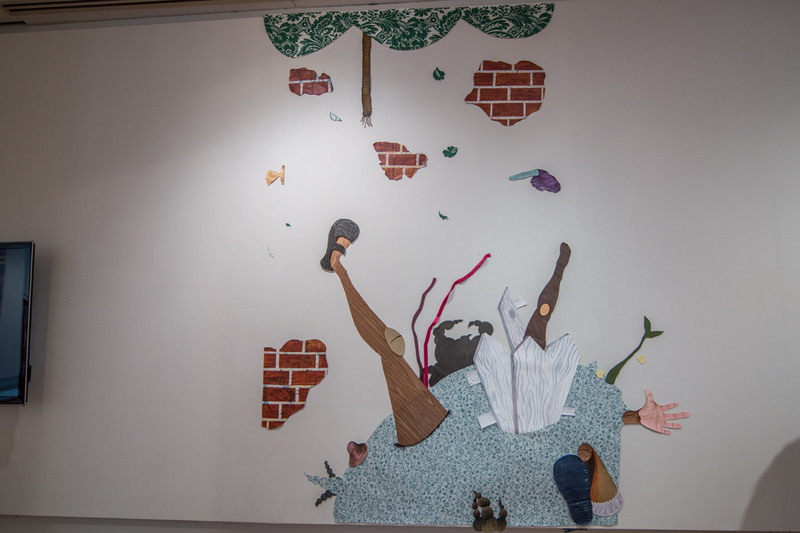 Alexandria Smith abstracts the body in drawings on cardboard with “when the bough breaks,” a hilarious work that depicts a broken rope, pieces of brickface, two legs sticking up in the air, an outstretched hand, and couple of errant braids. The piece is strong in its economy of visual language; it tells a story in suggested fragments, resonant bits and pieces that make the viewer an active part of the narrative. 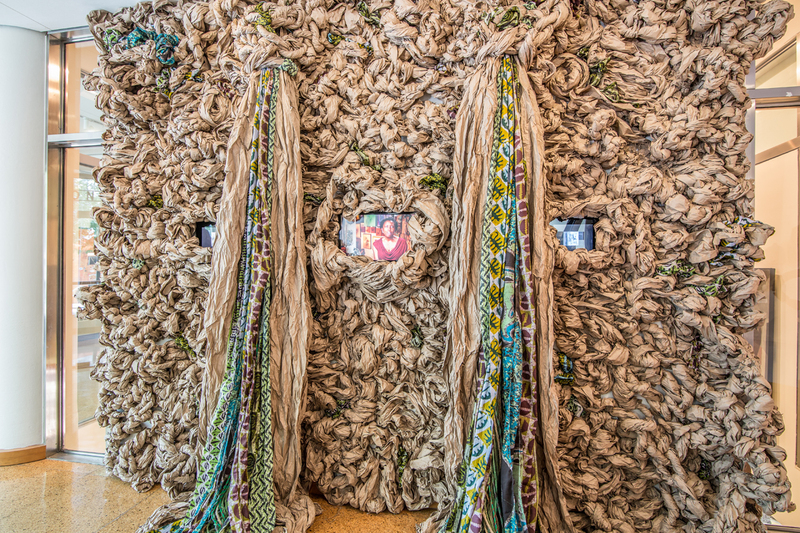 And Dianne Smith has created a large installation of hand-twisted brown paper braided with patterned fabric to form a dense grove in which are placed three video screens. “STUFF” takes the bodies of women into the digital demesne, telling their stories of love and loss and violence in a fixed-camera, documentary style. 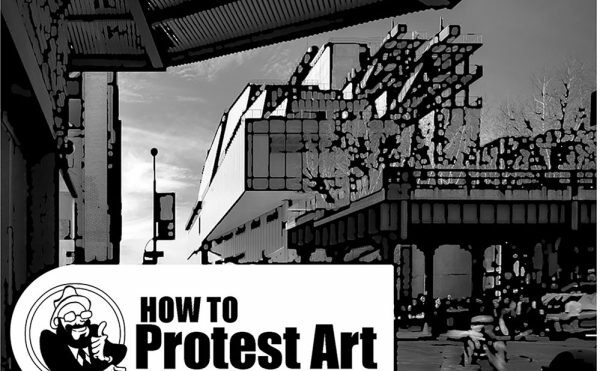 Though this strategy may be dated, Smith demonstrates that even in attenuated digital form, the voice is key to bodily being, because being heard is fundamental to our existence as subjects, and black women are prone to invisibility. Like much of the strongest work in i found god in myself, it is both alluring and unsettling. i found god in myself: The 40th Anniversary of Ntozake Shange’s for colored girls continues at the Schomburg Center for Research in Black Culture through January 3, 2015.